Measure application response time and throughput. Monitor application performance and availability of Ruby on Rails applications from end user to database perspective. 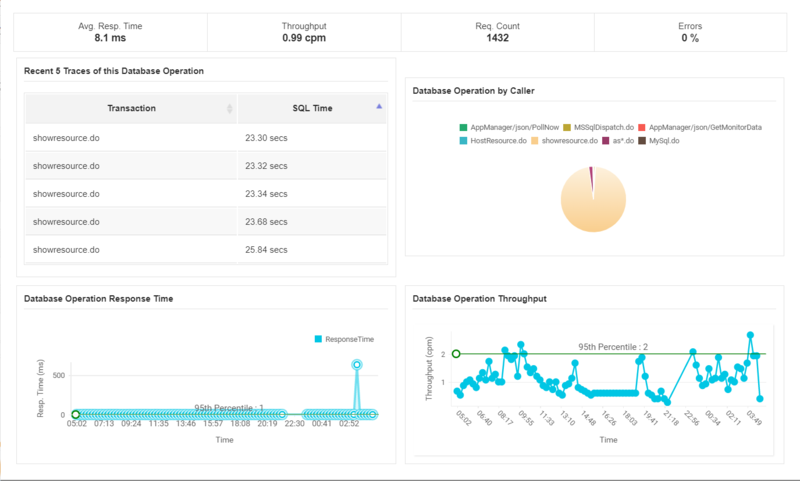 Applications Manager APM Insight helps to better visualize Ruby on Rails Web transactions, with insight into key performance metrics starting from response times to URLs to SQL queries. With end-to-end visibility into all tiers of your transaction, you can now identify and resolve performance degradation issues, no matter where they originate. Listing web transactions performed by a database helps you narrow down and isolate the root cause of performance slowdown. With APM Insight you can get detailed performance metrics to identify the slow database calls, database usage and overall performance of the database furnished with detailed graphical and tabular representations. Get the execution details (trace) for URLs displayed in a tree structure. The trace will chart the sequence of internal invocations (methods) of the URL. You can also identify the SQL queries executed during the transaction and thereby identify the worst performing database queries. Note: Ruby Web Transaction Monitor can be evaluated with our Professional Edition or Enterprise Edition (trial for 30 days). You can place a request for evaluation license here.